1. Apply Bio Seaweed Gel Polish Honey Bee for a yellow base. 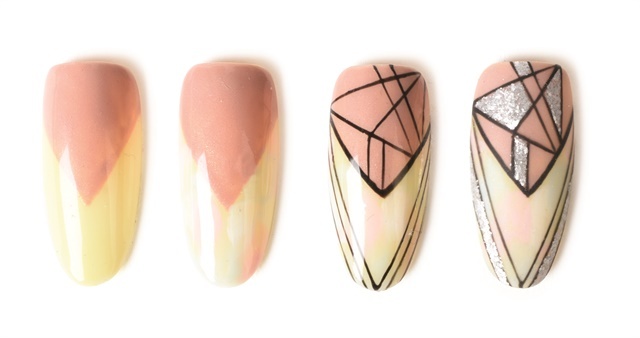 Paint a triangle at the base of the nails with Halifax. Cure. 2. Paint spots over the yellow base with a flat gel brush and Bio Seaweed’s Charlottetown, Powder Blue, and Snow White. Cure after all colors have been applied. 3. With a long liner brush and Fuzion Paintz Black create a geometric design and cure.